It has that sense, that feeling, you could tuck it away just anywhere and it would stay — yet it is none-to-hard to get to, always holding more than you thought, and yet, so gracefully disappearing into your pocket. It’s a near perfect wallet — the quest of any man. Conquered. If you have been following along at home, then you know that I have been looking for a new wallet for a few months now. A few weeks back, I sucked it up and sprung for a Dosh wallet — it sucked. I went back to a trusty older wallet, but there was a reason I had left that wallet behind, and thus I still needed a wallet. Every search ended the same, nothing to show for it, save a few promising looking, overly photoshopped, pictures. Then, while buying my normal allotment of paranoid end-of-the-world supplies, I came across this gem. It’s cheap, it feels cheap, but oh is it glorious. I went with the nylon model to reduce weight and the texture has just the right amount of friction to keep it in a shallow pocket without hanging up when you need to take it out. It is very slim, it holds a surprising amount and offers two quick access panels so that I can pull out just a card and pay. This is, quite honestly, the best and cheapest wallet I have ever had. The wallet is $6.50. 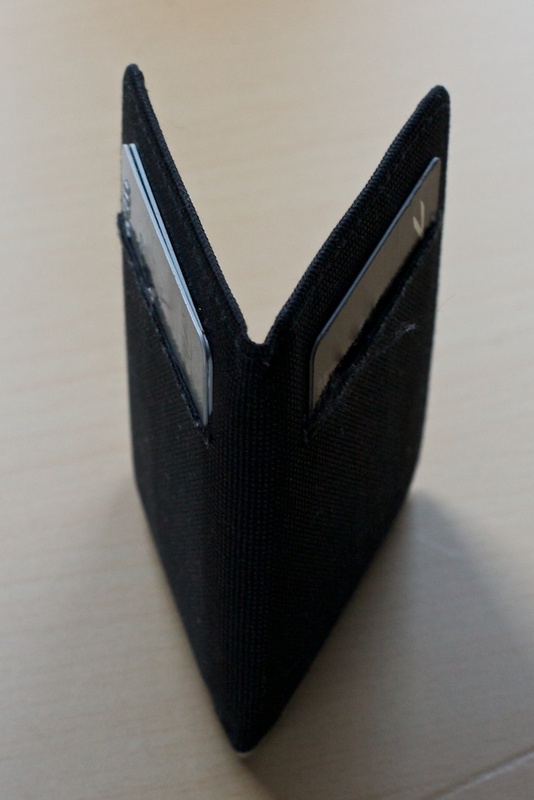 The wallet is near weightless when it is empty and close to flat. I have found through much trial and error and this is the ideal starting point for any good wallet. The wallet itself should not take up any space when it is empty, any space that it does take up is wasted — and thus should be as minimal as possible. 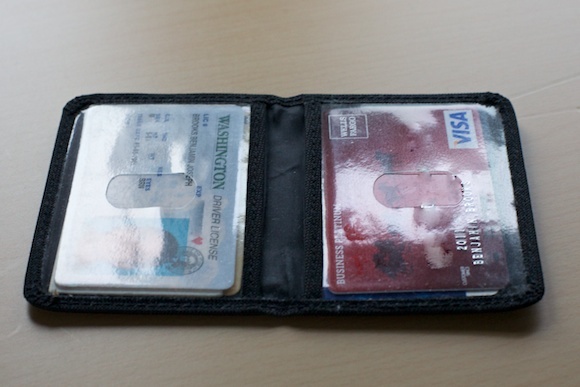 The outside of the wallet has two “quick access” slots that can hold at most two cards. I like to keep my normal use credit card on one side alone and on the other, my next two most used cards. This allows me to quickly distinguish between the two sides while the wallet is in my pocket, allowing me to remove the card that I need — it’s a great “feature” of the wallet. Inside there are just two pockets that are covered with a clear plastic. I’m not a fan of showing my ID or other cards through clear plastic, but that doesn’t hinder the operational assets of the wallet. I am carrying seven credit cards and two thick business cards in the wallet — with room to spare. The full coverage of the two clear compartments means that you can store business cards in them without the corners getting mangled — a nice touch. There is no way to carry cash in this wallet, outside one single bill that has been neatly folded. I rarely carry cash, so this isn’t a big deal, but it would be nice to be able to carry 5-8 bills if I wanted too. The nylon feels fine, but as you can see it is fraying along the quick access pockets. How much can you complain about that on a replaceable $6.50 wallet? Not much. 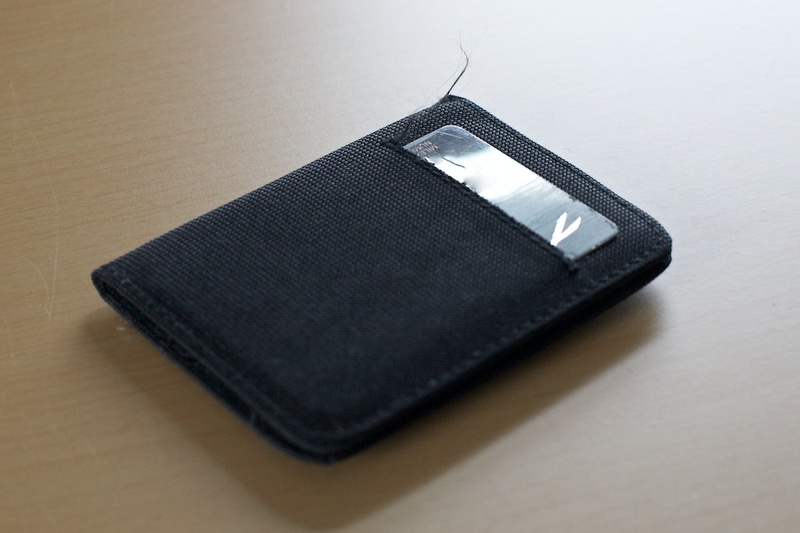 For now, this is the best wallet I have found — the cheapest too. Pretty surprising given that it wasn’t really designed to be a normal wallet and more of just an ID wallet for cops.